The Eight Elegant forms of Lord Ganesh are exquisitely portrayed in pure gold plated with Ganesh Yantra in the center. Lord Ganesh, who is the giver of Riddhi-Siddhi, is the primary lord to be worshipped. He is worshipped in every auspicios task. Ganesh Yantra is the giver of various types of Achievements and accomplishments. Due to the influence of this Yantra, the person attracts money, eight siddhis and nine niddhis. An elegant golden border frame enclosed them. These Eight Ganeshs are Moreshwar, Siddhivinayak, Ballaleshwar, Varadavinayak, Chintamani, Mahaganpati, Vighnahar, Girijatmak based at Eight ancient holy temples situated around different location. So through this Frame you can easily view Lord Ganpati forms all together at same time. These Mantras shower you with success and remove all obstacles in your path. There are many more benefits that will pleasantly surprise you. 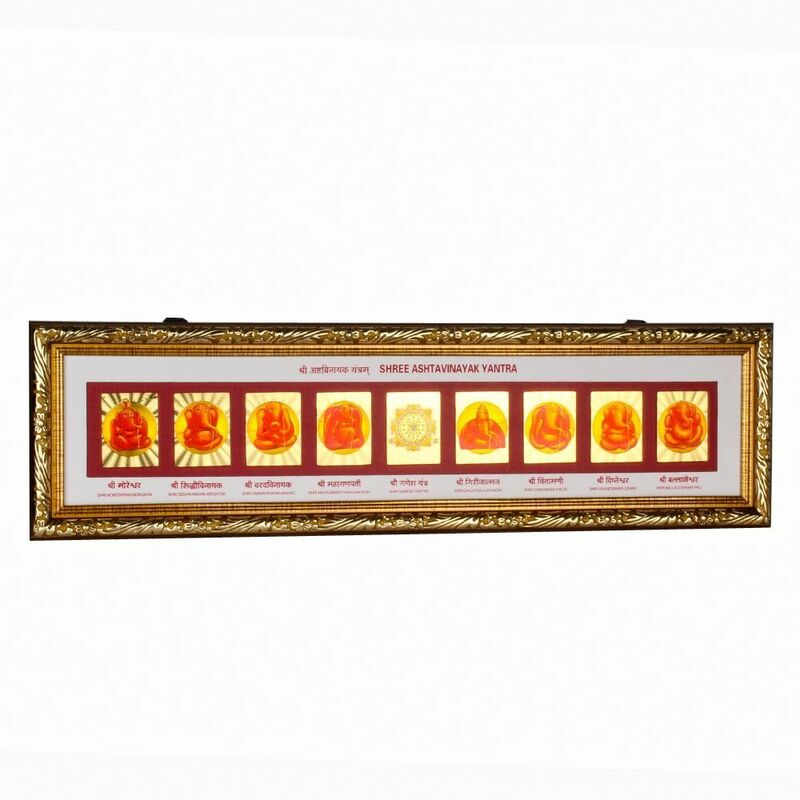 Wall Hanging of Shree Ashtavinayak with Yantra Frame.